We’re All Doomed, Did You Hear? Editor’s Morning Note: The end is nigh. Nigh as in March or April. 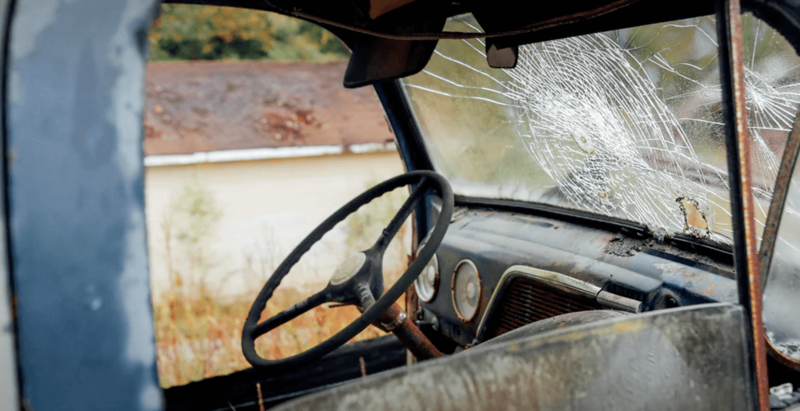 The broken windshield is an analogy. Recently on Investors.com, an article detailed the views of analyst Trip Chowdhry about technology companies, especially quickly-growing startups and their sometimes stretched valuations. Their take was simple: Things are out of sorts and headed for a correction. The view that an at-least-partially needed correction may loom is not hard to find online, even on these pages. It’s also not an uncommon view among founders and investors that I know; it’s the common view of the day. There are some bulls who see little that concerns, but the optimists are outnumbered by the worried, and the pessimists form their own contingent. Still, Chowdhry drew a line in the sand, so let’s take a look and see if we can get a toe over it. Rephrased, the analyst argues that the market isn’t merely overheated, it’s in a bubble-stage, and that the lack of intellectual property controlled by many popular, wealthy startups today implies that they will not be able to defend their valuations over time. Also, that Uber is worth something akin to 0.5 its current annual run rate. What reasons, aside from intellectual property, may lead to unicorn deletion? As everyone knows, the world is a winner-takes-all market, which is why WeChat, Facebook Messenger, WhatsApp, Line, and Kikao talk, many of which had regional hubs, are now all dead and a single chat app rules supreme1. This annoys not because Chowdhry is potentially wrong about Snap’s real value—he could, in fact, be more than correct—but instead that there is a better argument in favor of his position. Namely, Snap cannot—and will not ever—collect as much information about its users on a per-person, granular basis as Facebook; therefore, Snap will never offer the same sort of targeting that the larger network can easily provide. Ergo, it will generate less revenue per user. Ergo, using Facebook-like revenue analogs is bilge. Chowdhry’s point about foreign investment may or may not bear out. It’s a very fair concern to have. If non-traditional funds, including infusions from intrepid market influencers like Fidelity, halt their incursions, it could kneecap late-stage valuations for a period. However, the next paragraph concerning IPOs is surreal. How dare an IPO raise cash for corporate operations and provide liquidity to long-term shareholders? For shame. 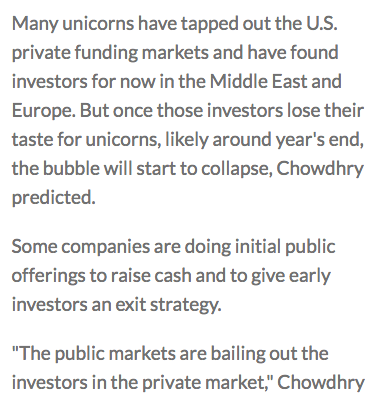 That scandal aside, the article uses Chowdhry’s words in the following paragraph to imply that there are lots of IPOs out there from crap tech companies, bilking the masses out of their hard-won bread-dollars to fuel silly things like green juice fountains and monster truck daycare for employees. Instead, of course, we’re in the middle of the worst year for tech IPOs based on the number of offerings since last year, which was the worst year itself since 2009. Oh well. From a stylistic point of view, Chowdhry should have selected Etsy, Castlight Health, Hortonworks and other, more dramatic failures in this complaint. I can’t quite tell you how the above points to a March or April correction. We could, of course, see a correction in those months, or the months on either side. I don’t know. But I do know that there are things that are silly in Silicon Valley. But we can at least get those things right, right? How cool would it be if that came true, and it was Twitter. All Hail The Fail Whale, The Great Whale That Cannot Fail. And yes, that was your chance to make a Decembrists joke.